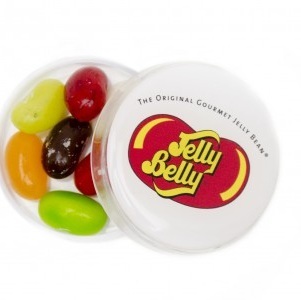 Jelly Belly personalised mini round - with your branding - Express Corporate - Promotional Products - Delivered Fast! Acrylic round pot filled with Jelly Belly jelly beans, choose 50 assorted flavours or select flavours / colours to co-ordinate with your branding. Features your logo in resin on the lid with a personalised label on front. 35mm diameter.